I absolutely love this bread! I recently had a few bananas that were begging to be made into banana bread and a little left over buttermilk in the fridge and wondered how the two would work together. Having never tried making a banana bread with buttermilk before I spent some time with my old friend Google, and found a few recipes that inspired me. As always, I tend to tweak quantities so depending on the size of your eggs and bananas, you may want to add another ¼ cup of flour to the mixture if it is a little too wet. It didn’t rise very much at all, so if you prefer using a self-raising flour, then leave out the baking powder, or simply use plain/all-purpose flour and increase to a full teaspoon (5 ml) of baking powder. I was quite happy with this size as it is a loaf, not a cake after all, and smeared with a little butter (or a lot!) a slice of warm bread straight out of the oven is heavenly. 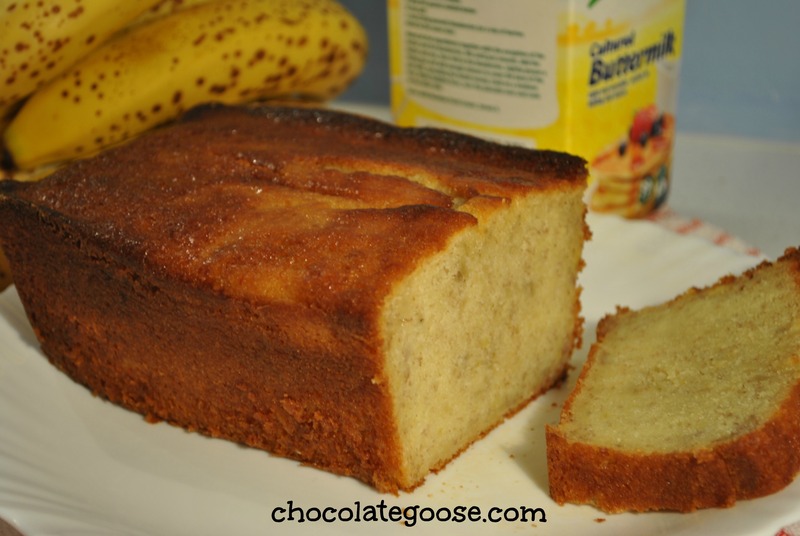 The texture is light and moist with the gentle fragrance and flavour of bananas. Once cooled, this loaf can be wrapped in tin foil and frozen whole, or cut into slices before being wrapped up and frozen. That way you can remove a few slices at a time if guests arrive or if you’re like me and like to include a couple of slices sandwiched together with a smearing of butter into a lunchbox as a treat. By morning tea they will have defrosted and be just as fresh, tasty and enjoyable as if the loaf was baked that morning. Next I might try adding a sprinkling of lemon zest to give a little extra sparkle. Preheat the oven to 180°C and grease and line (or flour-dust) a loaf tin. Mine is 22 cm long x 11 cm wide so a standard size. You might like to make muffins from this recipe or use a 22 cm round cake tin if you prefer it as a cake. Begin by creaming the butter and sugar together. Add the eggs, mashed bananas, buttermilk and vanilla extract. Beat together only until the batter is combined – do not overbeat the mixture. Add the dry ingredients and mix together. Pour into your chosen prepared tins and bake for approximately 50 minutes. Test the loaf with a toothpick or skewer which should come out clean. Cool the loaf in the tin on a wire rack for about 15 minutes before turning it out onto the wire rack. Be gentle with the loaf as freshly baked bread can fall apart if manhandled while still very hot. When you can no longer wait, carefully cut off a slice and smear with softened butter before popping into your mouth.